Happy Kitchen Sink Stamps Monday, thanks for stopping by today! As we celebrate the 4th of July holiday, let us take time to remember those who have served for our freedom. My original thought was to make a Red/White/Blue summertime fruit card to share today, but when searching through my papers, I didn't have any blues in the right shade to match my inks, so instead I just have yummy strawberries! I stamped the Multi Step Berries on White card stock, and die cut with Spellbinders Oval Dies. 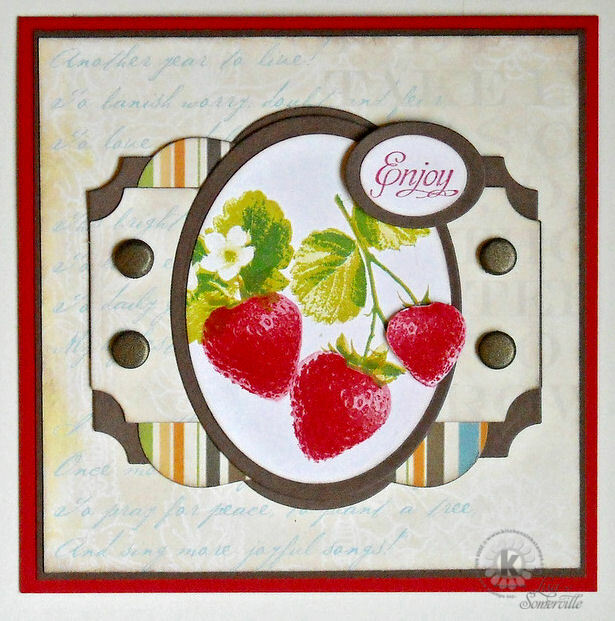 The small berry is stamped a second time and popped up on dimensionals, layering the stamped image on various Spellbinders Dies. wow lisa! this is just stunning. i love all the layers and i think this color scheme is fantabulous! Amazing what you can do with a little stamp! Luv all those nestie layers!! Love these beautiful strawberries! I have some chopped and ready for 4th of July strawberry short cake! Wonderful colors, papers, and layering to showcase these amazing berry images, Lisa! Have a fabulous 4th with family and friends!! Delicious looking strawberries! Love how you layered the dies and papers. Beautiful design! Sweet and beautiful card Lisa! I love the wonderful layout and yummy strawberries!